It is always richly rewarding to delve into the significance of the names that Baba sometimes gives to people or things. His residence at Puttaparthi, constructed in 1948-50, was named Prasanthi Nilayam (the Abode of Supreme Peace). All beings have to obtain it, sometime, somewhere; each has to build it for himself with His guidance and grace. Baba has cautioned the humanitarians and the philanthropists of this era that people today do not yearn for toys and trinkets which feed avid appetites; they yearn rather for the glory of God, peace on earth and goodwill among men. They need calm contentment rather than loud sensationalism. W.M. Dixon said in his Gifford Lectures, "In the new Garden of Eden, there will be good roads and water supply, unlimited picture houses, unstinted soft drinks, excellent sanitation, humane slaughtering, and the best of schools, wireless installations, free concerts and lectures for all. There will be no far horizon and invincible hopes. We shall cease to think of birth and death, of the Infinite, of God, and the sublime secrets of the universe. I am not much in love with these sixpenny Utopias." Baba has been insisting that those who draw five-year plans for dams, powerhouses, railway lines and factories must also provide adequate correctives for the devastation of traditional values which will follow the vast accession of pettiness and profit. People intoxicated with sudden prosperity and disheartened at the loss of traditions need Prasanthi and Prema to confer courage and equanimity. "Like children playing with dolls you, too, call some beings elephants and others horses, some friends and others enemies, and spend your entire life in such make-believe. Once you realise that without the spirit they are all just the same inert substance, the notion of 'many' and the diversity of name and form, both disappear and there can be no liking or disliking any more... You laugh and weep, love and hate, live in joy, sorrow, anger and fascination, but all these varied reactions do not make the objective world less unreal." Vairagya gets a new meaning in 'Prasanthi Vahini'. Raga means 'attachment' and Vairagya comes when you realise that the stone to which you were attached is really God. The 'stoneness' is like a veil cast by your ignorance upon what is really of the same substance as you yourself. The Vairagya that results from this illumination is lasting and most sublime. Baba has also commented favourably in this book on the eight traditional stages of spiritual education, but He has given each of them wider and deeper meaning. The first discipline is yama, which includes non-violence, honesty, celibacy and non-acceptance of gifts. Baba says, "This is the meaning usually given to this word. But I would say that Yama is really the giving up of attachment to the body and the senses." The second discipline is niyama, which is described in rajayoga texts as 'physical purity, mental exaltation, austerity, steadfast study and the attitude of surrender to God.' But Baba explains it in the following manner: "niyama is steady prema fixed on god, the Supreme Oversoul, regardless of time, place and circumstances." 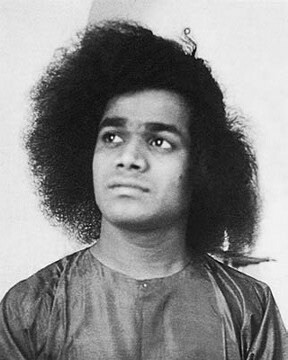 Asana, the next discipline, lays down the place, time and postures for the sadhaka engaged in meditation, to help him gain steadiness and stability. Baba has clarified it with a simple formula: "The best posture is udasina" (the posture of full relaxation and complete detachment). In the Yoga Sutras, Patanjali recommends sthira sukha asanam (a steady, comfortable style of sitting). Baba writes, "I am telling you the same thing in other words, that the most effective asana is the one least affected by the external world, and udasina means 'unaffected.' "
About pranayam Baba says, "In yoga, this step is explained as breath control. But the control of the vital airs is possible only for those who are aware that the world is an amalgam of truth and falsehood. The picture of the universe in the mind's eye will be like letters written long ago by lead pencils, now hazy, indistinct, indecipherable and giving impression half true and half false. Only a person aware of this peculiarity of creation can command the vital airs to obey his will." Baba also elaborates upon and clarifies the fifth stage called pratyahara, or the withdrawal of the senses of perception from the external world in order to free the mind for uninterrupted meditation on the inner one. How can this be done? The awareness that the external world is born of maya and sustained by maya, will provide the motive force to withdraw the senses. According to Baba, no other achievement can accomplish this task. So here, too, the acquisition of wisdom is a vital prerequisite. "Patanjali declared that when the chittha is established in one thought, it is called dharana. I would say that dharana implies more than mere negation of the multiple activity of the chittha... Treat your chittha like a little child; caress it into good ways, leading it with tenderness. 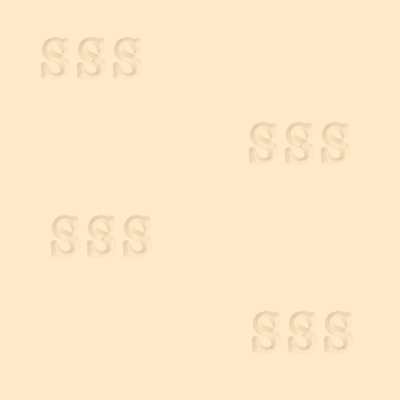 Gradually make it aware that all that is 'seen' is illusion, superimposition, make-believe. Remove its fears with love reprimands and focus its attention on the goal." Dhyana, the next stage, has a book for itself from the pen of Baba. Suffice it here to say that He reveals to us that dhyana is an uninterrupted dwelling of the consciousness within the consciousness itself. And the final stage of samadhi - the savikalpa, where there is but a trace of the knower, the to-be-known and the knowledge, and the nirvikalpa, where even this trace is effaced - is like the ocean, into which the consciousness finally merges. That is the goal where supreme peace reigns. "While repeating the prayer, if you do think ill of others or look down upon anyone, if you cannot tolerate difference of dress, language, faith or temperament, you can never promote peace. Your hearts have become pits of hatred, greed and jealousy. But from this day on, while your tongues pray for peace, let your hands be engaged in service and your hearts dwell in love." "Even the most potent drug will not cure when it is only extolled in elaborate phrases at the bedside of the patient. The drug must be taken in and allowed to work its way into the blood stream. Your reading what I write on dhyana will not make it easier. The mind is a mad pleasure-seeker, running after mirages seen through the inefficient and, therefore, deceptive senses of perception. The multifarious desires that infect the mind have to be quelled and the mind focussed on Ananda only. Of course, when the mind is enlightened that God is the highest Ananda, it will itself turn to God. When knowledge is accepted as the master and given charge of the reins, when the mind is denied the food that breeds depravity, when the senses are tamed by firmness and faith, dhyana will surely lead you to that Goal." Baba distinguishes between concentration, contemplation and meditation. Concentration is an unwavering determination in one's daily life, in the realm of the senses, the feelings and the intellect. Contemplation is achieved when the senses withdraw for some time and attachment to the objective world slackens. "When you have completely broken away from all attachment, you enter a state of meditation," says Baba. Baba gives the guidelines for meditation and mind control in 'Dhyana Vahini'. He says that dhyana is a life-sustaining as dhanya (food). "The methods vary greatly," says Paul Brunton, who has tried quite a few, "but they generally consist of physical asceticism and worldly renunciation, together with attempts to induce a contemplative mood by disciplining, during fixed periods, the confused drift of thoughts and impressions which make up man's inner existence." Baba explains the choice of place, posture, timetable and the curriculum, but lays greater stress on the compassion of the Lord who responds to the prayer embodied as dhyana. Since God assumes, for the sake of the sadhaka, the name and form that he meditates on, Baba assures us that dhyana need never be a barter endeavor; the summit can be reached by perseverance, for He raises up to Himself the struggling and the exhausted. "Nothing can be attained without ceaseless practice. So every moment you should remember God and be happy in the thought. Then only will you be able to attain peace. Are we not at peace when one thought ceases and another does not arise? You have to wait for that gap, be at one with that peace. Then that peace will become continuous and lasting. "Thoughts ever rise and subside as ripples on the surface of water. You have to look at the mass of water, not merely at the ripples. Similarly, the Atman ever dwells in peace; but man fails to realise this, and remains ever absorbed in the vacillations of the mind. Nityavadhan (constant vigilance) is needed to ignore the waves and watch the water... Restlessness is but the rise and fall of the wave on the ocean that you are." The next Vahini to be published serially in the Sanathana Sarathi was the 'Jnana Vahini' (Stream of Wisdom). "Whenever the gross and even the subtle are transcended, when the intelligence is clarified, when the self is free from feelings, impulses and instincts, what remains in the consciousness is the true self only. The person, then, is one with the eternal truth, the one beyond everything. He becomes Brahman or Paramatman," says Baba. Another of the Vahinis is the 'Upanishad Vahini', a synoptic review of the ten principal Upanishads, with a prologue and an epilogue on the rare text called the Brahmanubhava Upanishad. These Upanishads are esoteric and highly cryptic, but they elucidate the highest truths discernible to the intellect of man. On fifteen evenings Baba held a gathering of over five thousand students and scholars at Brindavan spellbound by His elegant and eloquent analysis of the Vedic word, Brahman, which means, as Baba writes in the 'Jnana Vahini', 'big, enlarged, gross, high', since it comes from the root 'brh'. He carefully untied the knots which pegged that portentous word to a cluster of irrelevancies and misconceptions. He traced the genealogy of the word from its roots to the tallest branch and the tiniest twig. He ransacked without compunction the nooks and corners of vedic texts to expose the excrescences that had gathered on that word as it rolled down the corridor of time. On subsequent evenings, for another fortnight, Baba spoke on another vedic word, Bharat. He elaborated upon the origin and migrations of the word among peoples and through the texts. Baba has declared more than once, that the revival of vedic studies and research, with the aim of reviving the practice of vedic ideals, is one of His plans for rehabilitating man. Baba, therefore, decided on a small book on the Upanishads, in order to rivet the attention of the world to the efficacy of vedanta. As editor of the magazine which published serially the chapters of this book, I had an amazing experience every month for a whole year. After despatching the magazine on the 16th of the month, I would go to Him for the next part of the series. Announcing the name of the Upanishad Himself, He would ask me to wait for a while in His room and proceed along the veranda with a notebook and pen, towards the room where there stood a table with a chair by its side and nothing else besides. Once, it was the turn of the Brihadaranyaka Upanishad to be summarised and simplified. It is the biggest and the profoundest of the ten. I am certain that Baba had never read it or consulted others who could talk on it. And there was no copy available anywhere within miles. But forty minutes after he moved out with the pen and the notebook as His sole possessions, I could descend the eighteen steps from His room with a ten-page dissertation on the truths this Upanishad enshrined! I peeped into the script as I walked towards the press and my eyes fell on the Telugu words which said, "The grandeur of the intellect of the Sage Yajnavalkya is impressively evident in this Upanishad." I told myself, "The grandeur of the omniscient teacher that Baba is, is now impressively evident to me." "Humanity stands to gain or fall by these ten... They are the synthesis of human thought, experience and aspiration at their highest. They confirm the possibility of human perfectibility. They declare and demonstrate that man can secure the awareness of God as His reality if only he casts off the veil of ignorance that he now delights to wear." Baba's 'Geetha Vahini' is the Bhagavad Gîtâ retold in order to save modern man from the myopia of egoistic materialism. He has declared that He has come to unify and clarify, fructify and fortify the holy aspirations of man. The doubts and delusions which torment us while we are engaged in the 'Battle of Kurukshetra' with our outer and inner kith and kin, are treated here with love and sympathy by Sai Krishna, who also provides us with the answers. I was once taken by an octogenarian pundit, a professor of sanskrit and a retired inspector of sanskrit schools in the state of Orissa, to the Gita Mandir that he had built at Puri. He had spent all his earnings on the construction of this memorial. 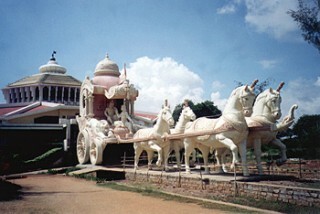 The temple is in the form of a magnificent chariot, over twenty feet in height, complete with wheels and horses. He had explained to me, with a glint in his eye and a tremor in his voice, the symbols he had got carved around the chariot. The figures represented various steps in sadhana and stages of spiritual achievement. 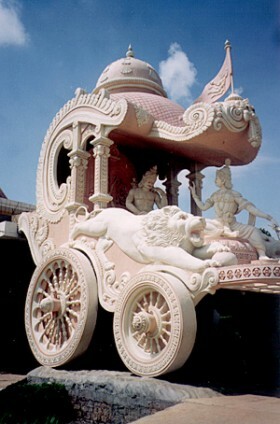 There was Hanuman on the flag of the pole fixed atop the chariot. And when we stood in front of the chariot. And looked up, I could see two mysteriously real statues seated upon it - the Lord, and His disciple who was just awakening from his self-inflicted stupor! It was a moment of thrill for me. I had not expected such a satisfying impact. I saw the disarming smile on the countenance of the Lord when He recognised the dawn of self-knowledge on the doubting and dismay-ridden mind of His disciple. 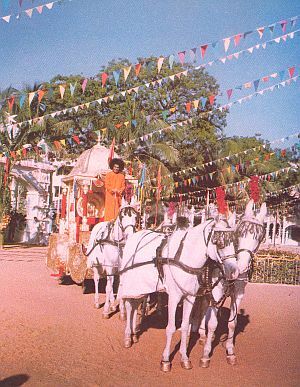 His hand extended lovingly towards Arjuna as if He wished to draw him closer to Himself, and on that hand I could see, resting upon His palm, the book of books - the 'Geetha Vahini' of Bhagavan Sri Sathya Sai Baba! I saw Sai Krishna comforting, consoling and convincing Arjuna. The pundit knew that Baba's 'Geetha Vahini' was not a resume or a commentary or an abridgement. It was the voice of Krishna Himself, ringing over the clash of hate and greed and calling us into more worthwhile victories. We are encouraged in 'Geetha Vahini' to offer Baba the prayer He puts into the heart of Arjuna: "As you are guiding this chariot, guide me also and show me the way," for He is in fact the charioteer installed in everybody. The Gîtâ as expounded by Baba, is a textbook of yoga and a guide for sadhana. It is a yogasastra and brahmavidya rolled into one. Through simile and story, sneer and laughter, banter and reprimand, question and counter-question, Baba pours into us the nectar of wisdom. At Kurukshetra, Krishna said that the mind and its vagaries can be tamed by abhyasa (discipline) and vairagya (detachment). In 'Geetha Vahini' Sai Krishna adds vichara (discriminative reasoning). Baba also analyses the concepts of kshetra, yajna, yoga and maya and sheds light on many corners which the lamps of the ancient masters did not illumine. The ideal of nishkama karma (selfless action) gets a glow of heroism when He interprets it as a conscious refusal of the fruits of activity, a courageous turning away from both triumph and failure. There are many passages in 'Geetha Vahini' of self-revelation by Baba, where it becomes difficult to determine who is speaking to us so intimately - Krishna or Sai. "How can I ever forget him who never forgets Me?" is the question. "Forgetting is a human frailty. Let me tell you: There is no need for yoga or tapas, or even jnana. I only ask you to fix your mind on Me, dedicate it to Me. That is all I demand, and all that you need to do." 'Geetha Vahini' also condemns fanatic, blinkered gurus and pompous exponents of the Gîtâ, whose oratory sounds hollow because they do not themselves practise what the Gîtâ preaches. 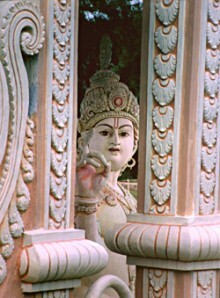 The Gîtâ is the central gem in the crest-jewel of the great Indian epic, the Mahâbhârata. Sage Vyâsa wove this intricate tapestry of sublime heroism - physical, mental, moral and spiritual. He had also codified the vedic hymns and rituals. He prepared a magnificent garland of aphorisms summarising the basic philosophic truths. In spite of his encyclopaedic scholarship and great creative skill in the realm of thought, Vyâsa was afflicted by a deep, inner sadness. He had no sweetness or peace left in him. [See Srîmad Bhâgavatam, Canto 1 : 4 & 5] Nârada, the sage who propagated the validity of devotion as a means of achieving bliss, had advised Vyâsa to describe the glories of God who had incarnated as Krishna [see for example: SB, Canto 10] . The exposition that did emerge from this advice is called the Bhâgavata Purâna. And Baba has given it to us again in a sweeter and a more concise form, as 'Bhagavatha Vahini'. The latest of the Vahinis to emerge from Baba's pen is a lucid narrative of Rama's life, the 'Ramakatha Rasavahini'. Baba has announced that He is the same Rama come again to carry out His mission through His horde of followers. Drawn by His love, we have the same good fortune now to share in His task of remoulding man after His image. While recounting the incidents in His life as Râma, Baba has included in His narrative certain details of dialogues and diversions not contemplated by Valmiki or any subsequent author. He mentions many additional events and encounters which fill the lacuna that have long disturbed admirers of the Ramâyana. The controversy over whether Râma is to be reckoned as an historic prince or as God incarnate, has been set to rest by Baba. 'Ramakatha Rasavahini' is the very nectar of the epic. The Avatar's pen writes letters to persons anguished by doubt or defeated by disaster. These letters carry His love and mercy into their hearts and heal the wounds that fester there. Invariably, they feed and foster the springs of spiritual striving and help in the growth of love. "You are not just boy and girl coming together. You are Shiva-Sakthi, hyphenated, as truly as I am, the right and the left halves of the same body. May you be ever in the shade of joy and contentment; may you both float as one on the waves of ecstatic love; may you sway merrily on the flower-bedecked swing of faith held by the ropes of courage and confidence; may this boat which you are boarding this day, be loaded with happy comradeship and festivity, health and wholesomeness, to reach safe and smooth at the lotus feet of the Lord. Row it forward, both of you, with the oars of self-surrender and service, and let its sails be filled with the breeze of grace." "Awaken! Sathya Sai who resides in your heart as your loving Mai (Mother), is heaping ananda on you. He is blessing you that you may have a long life, sound health, peace of mind, devotion to God, detachment from the transient objects of the world and success in the search for your own truth, your reality. May you, your children and your grandchildren be happy and prosperous; may you spread delight all around you; may you achieve the role of the witness content in the contemplation of the manifold leelas of God; may you ever be in good and godly company and may your hours be spent in the recapitulation of the glories of God. Here, hold forth your palm and receive this Amrita that I am offering, the amrita of love. No nectar can be sweeter and more invigorating." "Narasamma, accept My blessings. Sai is in your heart; He will not move away. Say 'Sai' with every breath; spend every moment repeating that name. Spend all your thoughts trying to picture Sai standing near you. Sai will save you. You will be merged in Sai. You will be in Sai eternally." It need not be said that a gentle calm descended upon the face of this blessed lady. Seconds before her death she chewed some vibhuti, miraculously dropped into her mouth by Sai, who gave her both darsan and prasad as promised. "I got your letter. I accept your prostrations. I am aware of the anguish which you communicate to Me. The anguish of separation from the One you really adore and love is the best sadhana. Be brisk in that sadhana. Continue yearning, more and more ardently. That is the best means of ensuring Sai's presence in your heart. I know you are happy only when you are in Sai. And, remember always, that your happiness is My daily food. My dear child! Why are you sad at not being able to serve Sai during the Dasara festival that is nearing fast. You are sorry that your mother's illness prevents you from coming to Me. Well, is not service to your mother, service rendered to Me? The mother who is called Aay-i, Thaay-i and Maay-i is no other than Saay-i. Serve her, and through that service, worship her. Why hesitate or doubt or grieve? All the time, ever with you as close and as alert as the eyelids to the eye, Sai is guarding you. He is where you are, accepting your day's puja, receiving your offerings and giving you the Ananda of grace. He will not forget you or give you up; He will never move out of your heart. Convey My blessings to your mother. Tell her on My behalf to fix her mind on the Atman as Râma, to the exclusion of every other thought. That is the strongest support, the most reliable refuge. That is the unshakeable, unseen base; the rest are but short-lived superstructures, mirages, castles in the air. Tell her to have the name always on the tongue and to meditate on God seated on the swing that oscillates in her heart. Tell her to picture God playing on the waves of Ananda inside her consciousness. That is the real sadhana which I teach every day. "Convey My blessings to your grihalakshmi (wife, also referred to as the goddess of prosperity and felicity presiding over the home). You can, very soon, be in the Presence and derive the Ananda you crave for." "Marriage binds two persons together as husband and wife. What were they to each other minutes before? The one would not have worried for the other if the wedding had not happened. Where was the son or the brother before conception? Life is an interlude between what was and what will be. During this interlude one should not lament over what cannot be helped or set right, but should seek God and take refuge in Him. Your husband lived a good life in the light of the Truth he had glimpsed. He did no wrong to anyone; he loved and served the suffering and the illiterate; he salvaged many families from penury and infamy; he helped many young people to go through college; many sick persons were saved by his timely donations; he was ever cheerful and spread cheer wherever he went; and, at last, God willed that he cast away the body that limited him. Of what use is it now to calculate what might have happened had he not gone to Madras that day? "Your duty now is to sustain the greatness he earned, to follow the ideals that he had placed before himself. Your husband is here, in My presence, and he will be here forever as he had wished to be, even when alive. 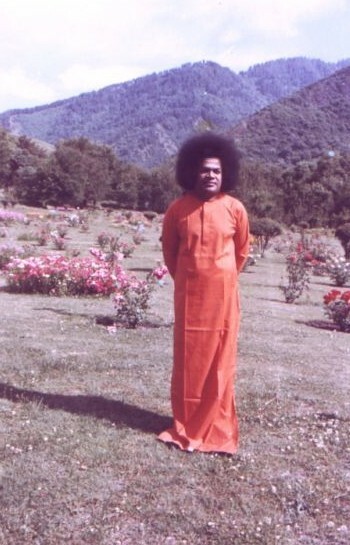 Swami will not allow him to be separated from His presence, he is now free from all bonds and boundaries. "You are indeed fortunate that destiny drew you to him and gave you so many years of loving companionship with such a fine person. His thoughts were pure; there was no blemish of envy, hatred, or greed in him. So his place is with Me, forever. I am writing this letter to you in order to shower on you the cool rain of love. That rain will scotch the flames of grief that are now raging within you. Your husband is at Prasanthi Nilayam, in the presence of Sai, having attained that climax by his spiritual aspirations." The Gîtâ describes the Lord as the friend of all beings (sarva bhootha suhrd). These letters reveal that he is more reassuring than any father, more affectionate than any mother, more considerate than any kinsman and more just than any human authority. The blessing that Baba confers on lives dedicated to God who is enshrined within us is, invariably, everlasting life in Himself.